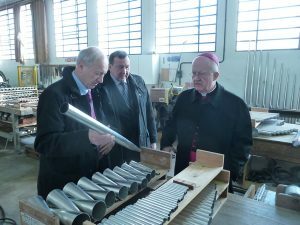 Bishop Kevin William Vann, of the Roman Catholic Diocese of Orange, came to Padova to tour the Ruffatti factory and see the inner workings of our style of organbuilding. 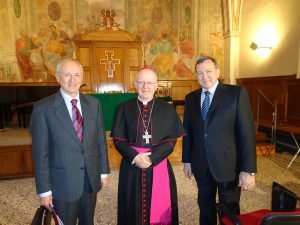 He met with Francesco and Piero Ruffatti in the Basilica of St. Anthony in Padova, Italy, to sign the contract for the restoration of the Ruffatti organ at the new Christ Cathedral, formerly the Crystal Cathedral of Garden Grove, California. 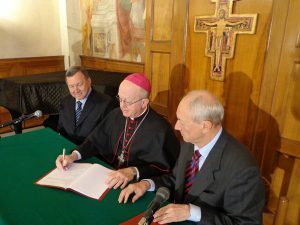 Piero and Francesco Ruffatti with Bishop Kevin William Vann in the Basilica of Saint Anthony, where the restoration contract was signed. The Crystal Cathedral was completed in 1981. The design by American architect Philip Johnson incorporated more than 10,000 rectangular panes of reflective glass. For more than thirty years, it was the main worship space for the Crystal Cathedral Ministries, founded by Robert Schuller. 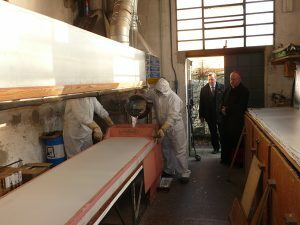 Sale of the building to the Diocese of Orange was finalized on February 3, 2012. The worship space is being renovated to accommodate the Roman Catholic liturgy. 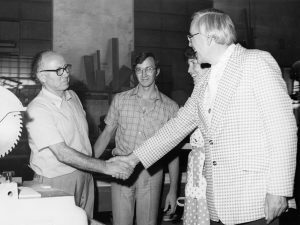 Robert and Arvella Schuller visit the Ruffatti factory in 1973 to see the 97-rank Ruffatti organ being built for the Garden Grove Community Church. The Hazel Wright organ is one of the largest pipe organs in the world. 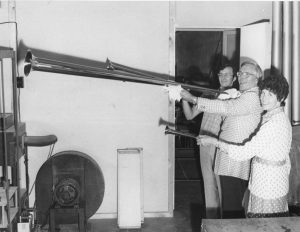 It was made possible by significant donations from Mrs. Hazel Wright, a regular viewer of Robert Schuller’s weekly television program “Hour of Power”. The organ was built by Fratelli Ruffatti on a design by Virgil Fox, using the 100-rank Aeolian Skinner organ from Philarmonic Hall in New York City and the 97-rank Ruffatti organ installed in 1977 into the Neutra Sanctuary of the Garden Grove Community Church, the predecessor congregation of the Crystal Cathedal Church. Ruffatti also added 29 ranks to the organ at that time. 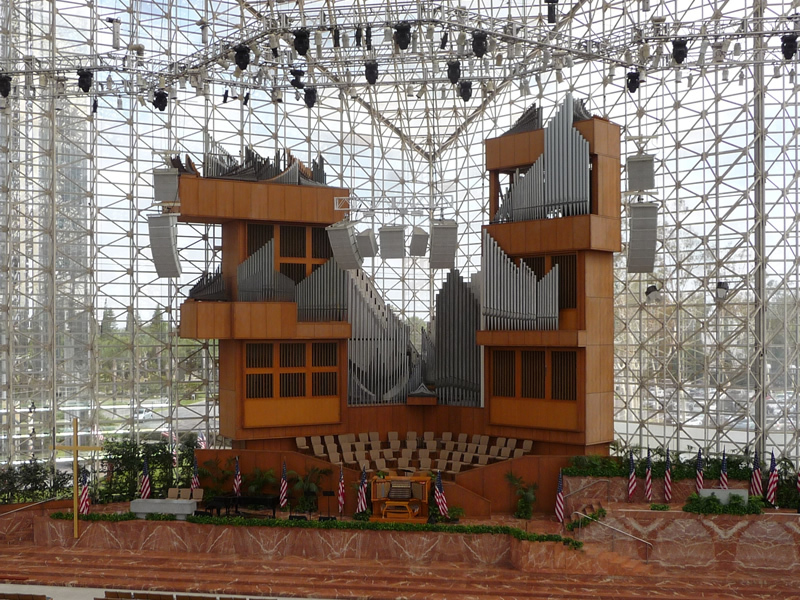 The instrument was dedicated in 1982 and was enlarged during the 16-year tenure of the Crystal Cathedral’s world-renowned organist emeritus, Frederick Swann. The organ currently comprises 270 ranks over fourteen divisions, and has more than 16,000 pipes. The console has five manuals. A 40-foot shipping container departed from the factory of December 16th, en route to Garden Grove, California. It was full of packing crates and packing material. A crew of five from the factory, headed by Piero Ruffatti, was joined by a local crew and local riggers in taking the organ apart. The crates were filled with pipes and other parts of the organ, to be returned to Italy for restoration. This part of the adventure took roughly five weeks.